I love Contigo’s Autoseal Water bottles We have one for my daughter and it is perfect. They seal up nice and tight so you don’t end up soggy, you don’t have to touch the spout to release the water (very sanitary) and the whole top folds back for easy cleaning. See more at GoContigo.com. 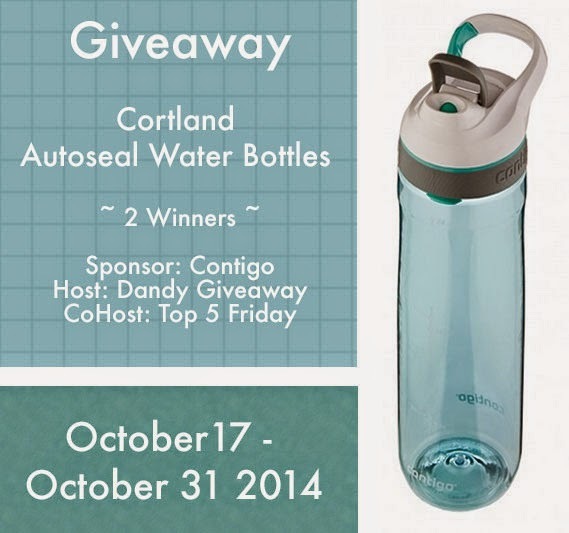 You can read a full review of the Cortland Autoseal Water Bottle from Brittney on Dandy Giveaway. The giveaway will run from October 17, 2014 through October 31, 2014 at 11:59 PM EST and is open to US residents, ages 18 and older. Entries will be verified. Winner will be notified via email and will have 48 hours to respond and claim prize or another winner will be selected. Brittney from Dandy Giveaway received products from Contigo to facilitate her reviews, no other compensation was received. All participating blogs are not responsible for prize fulfillment. This giveaway is in no way associated with social media sites including Facebook, Twitter and Pinterest.